Add sort and find features to the Open Data File interface window for a protected workbook. 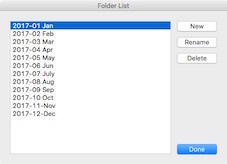 The user can add, rename and delete folders to hold files. The Open Data File window shows files from a selected folder. AddLicense can apply a Splash screen to your application launch. Your application can initialize behind the Splash screen to enhance the user experience. Use HTML formatting tags to customize a license agreement or information about your application. On first launch, the custom message is presented with a Continue button before the application can be activated. The API or AddLicense can bind an application to a batch of dongles. Create your own USB dongles with MakeDongle. Put application on the computer drive or dongle itself. For spreadsheet applications, encrypted documents can reside on the dongle to provide portability between computers. When using Safe Activation Service 3 for online activation, status logs can record when your application runs or licensing events occur. Monitor how your application gets used with real-time logs. Online activation requires communication with an activation server. Temporary Internet issues or aggressive virus scanners can disrupt that communication. Together QuickLicense and Safe Activation enhance online activation with an automatic retry using an alternative HttpGet command. Protect and license applications created with Microsoft Access. AddLicense can apply a license to an ACCDE file saved from Access. The LicenseSupport product provides an API to use or update data in your Safe Activation account from your website. The Support command allows your application to use LicenseSupport commands which are sent to the Safe Activation server as encrypted messages. Generate a floating license server for any application using QuickLicense Server. Users can see license users on the network from the License Server Status panel of the License Options dialog. AddLicense and OfficeProtect now supports Mac Excel 2011 and 2016. Share documents on licensed computers running Excel 2007 or later on Windows or Excel 2011 or 2016 on Mac. Add a grace period to the manual activation process. Users click to request an Activation Code. Allow the customer to use your Product or Subscription software for a few days while you manually process their activation request sent to you by email. 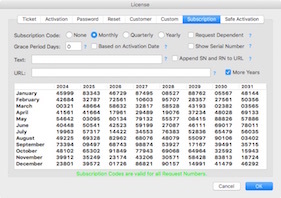 QuickLicense can supply 16 years of Subscription Codes without updating the Ticket. Give new or existing licenses an extended lifespan with new runtime software.